The key to floral photography at weddings is the same as the key to floral arrangements at weddings: to look attractive. Unlike forms of fine art photography, photojournalism, and even more general wedding photography, floral photography at weddings are really meant to capture the essence of the floral arrangements as an expression of visual beauty that is intended to maintain the themes of love and devotion that mark a wedding. Here are a few tips for floral photography at weddings so that you can make these images, which would not stand out on their own. Though there have been a lot of beautiful photographs of flowers in black and white, for most photographers this is going to defeat the purpose altogether. Floral photography at weddings is really meant to bring out the colorful elements of the flowers themselves. The flowers of the wedding are usually chosen to continue a visual color motif and their color is the central part of their attraction. Make sure to instead try to even over saturate the pictures of flowers, brining out the colors even more so during photo editing. When you are bringing in the final pictures of flowers through a program like Adobe Photoshop trying upping the contrast and saturation around twenty percent, possibly even drawing the general color in the direction of the primary colors of the flowers. This will make the color that defines the flower pop and stand out even more so. The lighting of the flowers when doing floral photography for weddings needs to be built around portrait lighting, because that really is what it is. 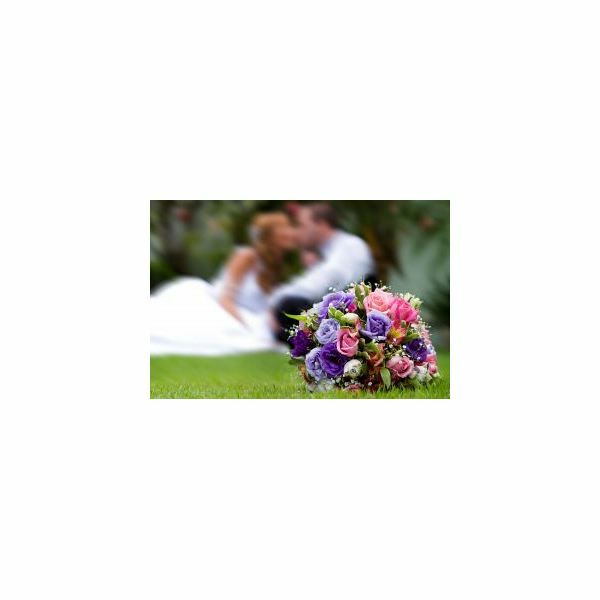 What you can do with the pictures of flowers that you cannot do with the rest of the wedding photography is control the situation very closely since you can actually do these photos before or after the ceremony, not when there is an actual event occurring. Here you can set up a complete studio lighting, keep a bright key light on the flowers themselves, and darken out the background so that they pop a little more. You can try to do a stronger contrast on the smaller arrangements or single flowers, but simply try to get larger arrangements bright and then you can deal with the contrast and background when you are editing them. The camera is not going to need to remain mobile at any point and time when doing floral photography for weddings, so you have no advantage for keeping it off a tripod. Instead, allow the tripod to be an integral part of the image construction and every flower image that you could get during the active ceremony you could get afterward by staging the situation. For example, the bride holding the floral bouqet while walking down the aisle is a popular form of floral photography for weddings. Instead of getting this flower image when it is actually happening, just have her pose afterwards in front of the tripod. This is also going to open up the options that you have in terms of camera settings, especially shutter speed. You can bring down the shutter speed quite a bit when you have the ability to stabilize the camera and subject this much. This will allow you the freedom to set the ISO and aperture for the proper image quality and depth of field, respectively. Articles with tips for different types of photography.